Имате въпрос към 16 Alley Hostel? Удобно разположен в Кентин, 16 Alley Hostel е чудесна стартова точка, от която можете да започнете да проучвате този оживен град. Хотелът не е далеч от центъра на града - намира се само на 1.1 km от него, а до летището се стига за около 10 минути. Понеже главните забележителности на града като Hengchun Tourism Hospital, Болница Nan Men, Nan Men General Hospital са близо до хотела, неговите посетители ще харесат разположението му. Предлагайки висококачествени услуги и широка гама от удобства, 16 Alley Hostel Ви осигурява възможно най-комфортния престой. Гостите на хотела могат да ползват съоръжения като безплатен WiFi достъп във всички стаи, експресно настаняване/напускане, съхраняване на багаж, Wi-Fi връзка в общите части, паркинг. Като допълнение всяка хотелска стая предлага широка гама от удобства. Много от стаите са с телевизор с плосък екран, безжичен интернет достъп (безплатен), стаи за непушачи, климатик, големи легла с дължина над 2 метра, за да удовлетворят и най-изискания вкус. Освен това в хотела можете да се възползвате от множество предложения за приятно прекарване на свободното време. 16 Alley Hostel е най-подходящото място за Вас, ако търсите качествен хотел в Кентин. If you love cats then you need to stay here. Don’t hesitate, book now! When we were there a mama cat just had baby kittens and they were so cute!! I LOVE CATS. Ahhhhh!!! The room is nice too and the location is chill, a 5 minute walk to the old gate and old street. GO VEGAN. Stayed for 2days. Owners were very kind and helping. They guided very well for scuba diving and getting electric bikes. Nice stay altogether. Also owners arranged and did BBQ along with us. It was like a home stay. Very new building and nice and neat rooms. I stayed for two nights there, the room was large ,comfy and clean. The location was quite nice, its a few minutes' walk to bus station and 7-11. The most important thing is the hosts were incredibly helpful and friendly. i had an accident and was not able to move around, the couple was extremely nice that they drove me to many places so i didn't need to stay in the room. It was a wonderful stay to end my trip in TaiWan.Highly recommended ! i will definitely stay here next time when i come to TW:) PS: the three cats were soooooo adorable! Don't hesitate if you are cat lover! Jenny and her boyfriend are incredibly helpful, especially if you don't know the Kenting area. They will provide you with maps, explanations, and even pick you up from the bus station. The rooms are nice with working AC units and refrigerators. There is free water in the lobby and a grill in front to use. The hostel is located three blocks from a 7-Eleven, where you can catch a bus to the beaches. There are also several scooter rental shops nearby. We had an excellent stay here! 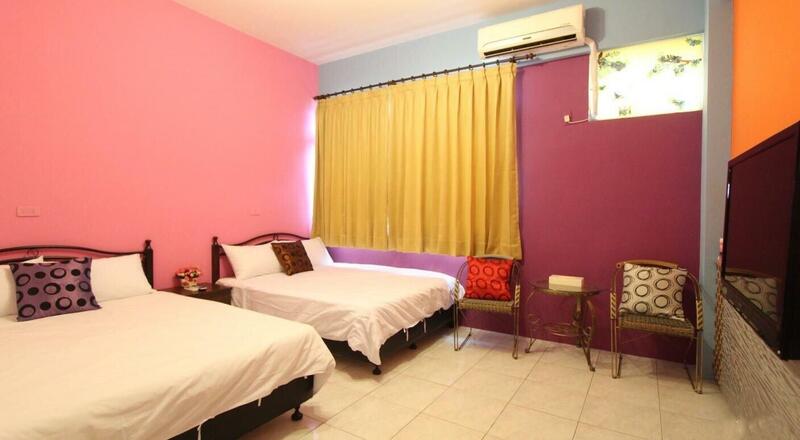 This hostel is located near the city center of Hengchun and is ideal for exploring the Kenting Area. We were happy with the decision not staying closer to Kenting Street. The location of this hostel is less touristy, yet close to the beaches and tourist area of Kenting (15-20 minutes by motorcycle). The hosts are super friendly and able to help you with all your questions. Jenny speaks very good English, so that made our stay even better. Henchung has a lot of nice restaurants and also the aquarium is worth a visit. We enjoyed our stay very much. And if you like cats, this place is even better. 3 'House cats' live on the ground floor/lounge area. This hotel has a great price and the location is only a few minutes walk from the Hengchun bus stop, so it's super easy to get to the beach from here and to catch a bus back to Kaohsiung. The rooms are spotless and big. But what really made this stay stand out are the owners are super friendly! They picked us up when we couldn't find the hotel in the dark and they chatted with us about where to go in town, even recommending a great dumpling restaurant. Thanks 16 Alley Hostel! I'll be recommending you guys to all my friends. nice big clean rooms and the staff were very helpful.